PREFACE This Course Guide was developed in part because of the high cost of college textbooks, and in part, to help organize students’ studying by providing lecture notes together with the reading assignments. 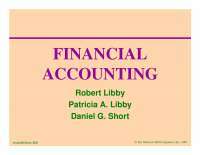 This Guide is provided to the student online at the Department of Economics website. Jayla Heller, the Department’s secretary has been kind enough to go through all of the frustration and hard work to put the guide in the appropriate format and put it online. To her goes my gratitude. The department, neither school, nor the professor make anything whatsoever from this Guide. In fact, the department’s budget and the professor’s own resources are used in the writing of the Guide, and the numerous draft copies that are produced in the revisions of this document. Like the sign in the Mom and Pop bait shop on Big Barbee Lake says, “This is a non-profit organization, wasn’t planned to be – it just worked out that way.” Well, actually it was planned to be a non-profit enterprise in this case. The professor also wishes to acknowledge the fact that several students have proposed changes, improvements, caught errors, and helped to make this document more useful as a learning tool. Naturally, any errors of omission or commission are those of the professor alone. Introduction & Use of Guide This Course Guide is provided to assist students in mastering the subject matter presented E202, Introduction to Macroeconomics. The commercially available student guides and workbooks are notoriously inadequate and are simply of little value. At several institutions, prepared course materials are made available to students to assist their learning. What research has been done concerning these course specific materials, suggests that students' performances are enhanced by having access to these types of materials. Because macroeconomics is such an important foundation for business, engineering, and the social sciences this Guide has been prepared. The purpose of this Course Guide is fourfold. First, the course syllabus is included in the Guide. Second, the Guide provides the student a listing of the key concepts covered in the lectures. Third, the Guide provides students with problems and study-guides to aid each individual in the retaining the materials presented by the text and lecture. Fourth, sample exams are offered as self-test exercises and to give students an idea of the level of mastery expected in this course. Organization The Guide is divided into twelve units, following the organization of the Tentative Course Outline found in the syllabus. At the end of each chapters in the reading assignments there is a section containing the key concepts developed in the chapter, sample exam questions and a brief study guide. Also in the Guide is the course syllabus included before the twelve sections covering the substantive portions of the course. Following the reading assignments are the lecture notes for each chapter. The final section of the Guide contains sample examinations, including answers. Note to Students There is no substitute for doing the reading assignments, attending class, and working through the material. A teacher cannot cause a student to learn, all a teacher can do is to organize and present the material, grades can provide a small extrinsic reward for accomplishment, but it is the student's ability, effort, and desire that determine how much and how well they will learn. It is hoped this Guide will help in the learning effort. 1. In all respects, the policies of the School, Department, IPFW and the University shall be applied in this course. arranged. The Professor's office is Neff 340D. All final grade calculations shall be rounded up. In other words, 69.01 and 69.99 percent are both considered 70 percent and will earn the student a grade of C.
had average final grades that fall within the range centered on 2.0 on a 4.0 scale. A. The MIDTERM examination is worth 40% of the final grade. The FINAL examination is worth 50% of the final grade. The QUIZZES are worth 10% of the final grade, and only the best two quiz scores will be used in this calculation. If a student improves their performance on the final examination by 10 full points above what they earned on the midterm, I will change the weights to midterm 30% and final exam 60%. 100 points, and will consist of twenty multiple choice questions (worth four points each), and twenty true-false questions worth one point each) for a total of 100 points. 6. The final examination will be given at the time and place scheduled by the university. No exception is possible. you must make prior arrangements to take an equivalent examination before your classmates. Exceptions may be granted for cases where there was no possibility for an earlier examination, i.e., injuries or illnesses, etc – things clearly beyond the student’s control. sanctions as may be authorized by the university. The over whelming preponderance of students do not engage in dishonesty, and the professor owes it to these students to strictly police this policy. 9. The provisions of these policies and the course objectives are subject to testing. These policies are also subject to change at the discretion of the professor and do not constitute a binding contract. 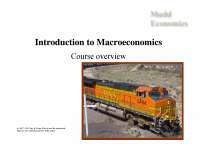 COURSE OBJECTIVES This is an introductory principle of economics course that covers topics in macroeconomics. The breath of topical coverage limits the course objectives to subject matter mastery. The course will present factual material concerning the operation of the aggregate economy as well as the development of rudimentary understanding of economic policy. In general, the ability to critically evaluate demonstrates the highest cognitive mastery of the material. It is important that this level of understanding be achieved. Therefore, students will find several examination and quiz questions are focused on complex applications or critical evaluation. Even though there are no grades assigned for class participation, students are encouraged to participate in classroom discussions. The opportunity to have open discourse, to debate, to disagree is critical to a student's learning experience; particularly if students are to develop the ability to critically evaluate economic ideas. 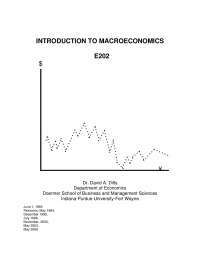 REQUIRED TEXT David A. Dilts, Introduction to Macroeconomics, E202. Fort Wayne: 2003, memo. 1. Economics Defined - Economics is the study of the allocation of SCARCE resources to meet unlimited human wants. economic agents such as firms and consumers. 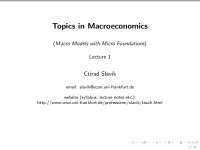 b. Macroeconomics - is concerned with the aggregate performance of the entire economic system. d. Economic theory - relies upon principles to analyze behavior of economic agents. e. Inductive logic - creates principles from observation. f. Deductive logic - hypothesis is formulated and tested. 2. Usefulness of economics - economics provides an objective mode of analysis, with rigorous models that are predictive of human behavior. 3. Assumptions in Economics - economic models of human behavior are built upon assumptions; or simplifications that permit rigorous analysis of real world events, without irrelevant complications. the one that best describes reality and is the simplest. 1. Ceteris paribus - means all other things equal. 2. Problems with abstractions, based on assumptions. Too often, the models built are inconsistent with observed reality - therefore they are faulty and require modification. When a model is so complex that it cannot be easily communicated or its implications understood - it is less useful. 4. Goals and their Relations - Positive economics is concerned with what is; normative economics is concerned with what should be. Economic goals are value statements. 8. Reasonable balance of trade. the subject of different points of view, often caused by politics. b. Complementary - goals that are complementary are consistent and can often be accomplished together. 6. The Formulation of Public and Private Policy - Policy is the creation of guidelines, regulations or law designed to affect the accomplishment of specific economic goals. 1. Stating goals - must be measurable with specific stated objective to be accomplished. 3. Evaluation - gather and analyze evidence to determine whether policy was effective in accomplishing goal, if not re-examine options and select option most likely to be effective. a. Bias - most people bring many misconceptions and biases to economics. Because of political beliefs and other value system components rational, objective thinking concerning various issues requires the shedding of these preconceptions and biases. the individual, must be true for the group. c. Cause and effect - post hoc, ergo propter hoc - after this, because of this fallacy. causality states that the thing that causes another must occur first, that the explainer must add to the correlation, and must be sensible. benefits of an action will reap more benefits than costs it is rational to do that thing. 1. Gross Domestic Product - (GDP) the total value of all goods and services produced within the borders of the United States (or country under analysis). produced by Americans regardless of whether in the United States or overseas. 3. National Income Accounts are the aggregate data used to measure the well- being of an economy. a. Nonmarket transactions such as household-provided services or barter are not included in GDP. however, movie tickets, skis, and other commodities used in leisure time are. account for the composition or distribution of income or output. We must look at sectors to determine composition and other information for distribution. or consumption is not counted in GDP data unless market transactions occur to clean-up the damage. economic activities may be as much a one-third of total U.S. output. Criminal activities, tax evasion, and other such activities are the underground economy. 6. Price Indices - are the way we attempt to measure inflation. Price indices are far from perfect measures and are based on surveys of prices of a specific market basket of goods. a. Market basket surveys - The market basket of goods and services are selected periodically in an attempt to approximate what the average family of four purchases at that time. b. CPI (U) is for urban consumers & CPI (W) is for urban wage earners. GDP Deflator is based on a broader market basket and may be more useful in measuring inflation. 1. Standard of living - is eroded if there is inflation and no equal increase in wages. the rate of inflation, but only proportionally. 3. Other indices - American Chamber of Commerce Research Association in Indianapolis does a cross sectional survey, there are wholesale price indices and several others designed for specific purposes. experienced deflation - which is a general decline in all prices. Inflation is primarily a post-World War II event and is defined to be a general increase in all prices. describe money value or prices (not adjusted for inflation); real is used to describe data, which are adjusted for inflation. index is more than 100.
a consistent series (remembering market baskets also change, hence the process has a fault). The process is a simple one. If you wish to convert a 1982 base year index to be consistent with a 1987 base year, then you use the index number for 1982 in the 1987 series and divide all other observations for the 1982 series using the 1982 value in 1987 index series. 1. Business Cycle - is the recurrent ups and downs in economic activity observed in market economies. d. Secular trends are long-run trend (generally 25 or more years in macroeconomic data. a. Frictional - consists of search and wait unemployment which is caused by people searching for employment or waiting to take a job in the near future. technology, or a change in the structure of demand. c. Cyclical - due to recessions, (business cycle). 3. Full employment - is not zero unemployment, full employment unemployment rate is the same as the natural rate. 1. Potential output - is the output of the economy at full employment. 4. Unemployment rate - is the percentage of the workforce that is unemployed. a. Labor force - those employed or unemployed who are willing, able and searching for work; the labor force is about 50% of the total population. equivalent) available to them, at 6 million U.S. workers were involuntarily part-time, and about 10 million were voluntarily part-time employees in 1992.
because they could not find an acceptable job. d. False search - those individuals who claim to be searching for employment, but really were not, some because of unemployment compensation benefits. a. Okun's Law states that for each 1% unemployment exceeds the natural rate there will be a gap of 2.5% between actual GDP and potential GDP. a. Occupation - mostly due to structural changes. b. Age young people tend to experience more frictional unemployment. c. Race and gender reflect discrimination in the labor market and sometimes in educational opportunities. 7. Inflation - general increase in all prices. Using a naive aggregate demand - aggregate supply model (similar to the supply and demand diagrams for a market, except the supply is total output in all markets and demand is total demand in all markets, as the aggregate demand shifts outwards prices increase, but so does output. 10. Effects of inflation impact different people in different ways. If inflation is fully anticipated and people can adjust their nominal income to account for inflation then there will be no adverse effects, however, if people cannot adjust their nominal income or the inflation is unanticipated those individual will see their standard of living eroded. the future with money that is worth less, thereby creditors are harmed by inflation. which may contribute to future inflation. c. Savers generally lose money because of inflation if the rate of return on their savings is not sufficient to cover the inflation rate. purchasing power of consumers' accumulated financial assets. b. Interest-rate effect - assuming a fixed supply of money, an increase in the price level increases interest rates, which in turn, reduces interest sensitive expenditures on goods and services (e.g., consumer durables - cars etc. foreign goods, domestic consumers will purchase more foreign goods as substitutes. 2. Determinants of aggregate demand - factors that shift the aggregate demand curve. 3. Aggregate Supply shows amount of domestic output available at each price level. The aggregate supply curve has three ranges, the Keynesian range (horizontal), the intermediate range (curved), and the classical range (vertical). a. Keynesian range - is the result of downward rigidity in prices and wages. b. Classical range - classical economists believed that the aggregate supply curve goes vertical at the full employment level of output. c. Intermediate range - is the range in aggregate supply where rising output is accompanied by rising price levels. 4. Determinants of Aggregate Supply cause the aggregate supply curve to shift. c. Changes in the legal/institutional environment. producers are unwilling to accept lower prices (rigid prices and wages) therefore there is a ratcheting of the aggregate supply curve (decrease in the intermediate and Keynesian ranges) which will keep the price level the same, but with reduced output. In other words, there can be increases in prices (forward) but no decreases (but not backward). An increase in aggregate demand from AD1 to AD2 moves the equilibrium from point a to point b with real output and the price level increasing. However, if prices are inflexible downward, then a decline in aggregate demand from AD2 to AD1 will not restore the economy to its original equilibrium at point a. Instead, the new equilibrium will be at point c with the price level remaining at the higher level and output falling to the lowest point. The ratchet effect means that the aggregate supply curve has shifted upward (a decrease) in both the Keynesian and intermediate ranges. a. Underspending unlikely - spending in amounts less than sufficient to purchase the full employment level of output is not likely. output declines because prices and wages would adjust to keep the economy at the full employment level of output. b. Among others, there is one glaring omission in Say's Law -- what about savings? b. Savings give rise to investment and the interest rates are what links savings and investment. macroeconomic equilibria and that only the government could cause disequilibria. what was going on, hence a new model was developed -- the Keynesian Model. a. Full employment is not guaranteed, because interest motivates both consumers & businesses differently - just because households save does not guarantee businesses will invest. a. Consumption schedule - the 45-degree line is every point where disposable income is totally consumed. The consumption schedule intersects the 45-degree line at 400 in disposable income, this is also where the savings function intersects zero (in the graph below the consumption function). To the left of the intersection of the consumption function and the 45-degree line, the consumption function lies above the 45-degree line. The distance between the 45-degree line and the consumption schedule is dissavings, shown in the savings schedule graph by the savings function falling below zero. To the right of the intersection of the consumption function with the 45 degree line the consumption schedule is below the 45-degree line. The distance that the consumption function is below the 45-degree line is called savings, shown in the bottom graph by the savings function rising above zero.